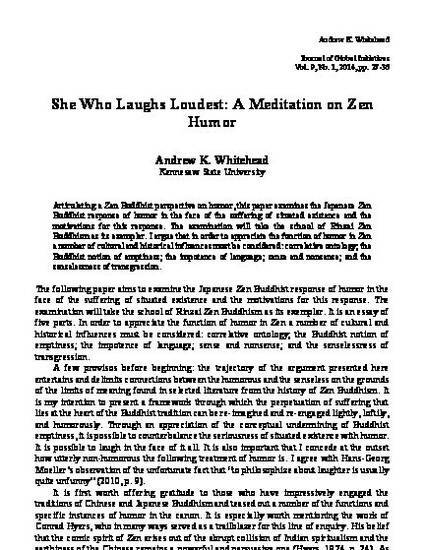 Articulating a Zen Buddhist perspective on humor, this paper examines the Japanese Zen Buddhist response of humor in the face of the suffering of situated existence and the motivations for this response. The examination will take the school of Rinzai Zen Buddhism as its exemplar. I argue that in order to appreciate the function of humor in Zen a number of cultural and historical influences must be considered: correlative ontology; the Buddhist notion of emptiness; the impotence of language; sense and nonsense; and the senselessness of transgression.